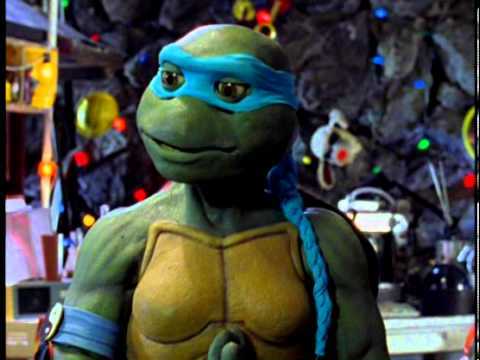 Saban’s Ninja Turtles: The Next Mutation; The most hated thing in all TMNT and it can only be used to be joked about. As a kid I never got to see THe Next Mutation, however I always wanted to see it. I loved the idea of the turtles being older and thought the idea of a female turtle was awesome, not to mention the Dragonlord looked awesome. 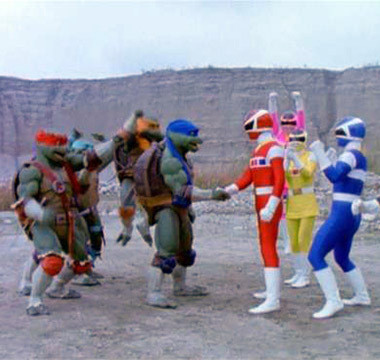 My only exposure to the show was the Power Rangers team-up, but still I didn’t think the show would be that bad. 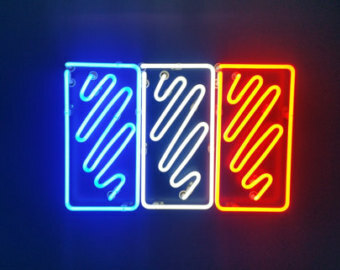 And is it? no its not, It’s actually pretty decent, yeah it has its silly moments but also has some cool ones and tons of untapped potential. That’s the short version, I decided to divide my post in three parts since it was too long for one post. First overall review of the show, then the episode reviews and third the potential that a second season had. The Turtles personalities are about the same from the movie, in fact the show is done as a continuations to the live action movies, no contradictions like some people say. Splinter seems off scale, I don’t know why that is if you notice he seems to be in scale with the other turtles media but here he just looks too tall; I think it’s the fact that the Live Action movies always portrayed Splinter as much smaller. The turtles personalities are the same as their movie counterparts which is good. Some random thoughts..April seems to make a cameo or two giving the news on TV. It seems that they wanted to disassociate from the original show since you never see them eating pizza besides maybe once and they never say Cowabunga; Mikey tries but they stop him. Both things that also didn’t happen in the 4Kids 2k3 show The ending song features the turtles giving a concert probably a homage to the Coming out of their Shells tour. At one point Mikey has cereal with soda!. The catchphrase is Certified Turtlefeid, which is awful but grows on you for some weird reason. Venus doesn’t appear that much. I also like the opening and ending songs. 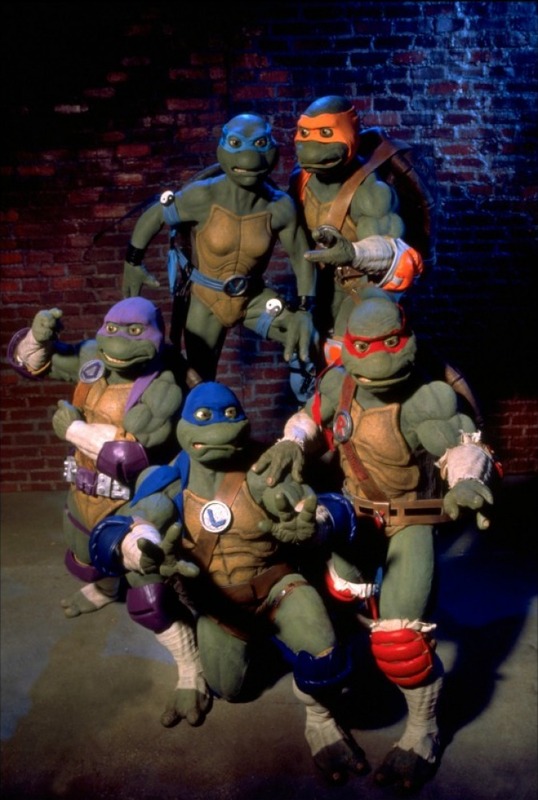 When the show came out and I saw the figures I thought the idea of a female and fifth turtle was awesome. I still thought that until I watched it…and I still like it! It adds something fresh to the franchise even if not something you want permanent. The TMNT fad had ended so I see why people see her as something bad for the franchise and even blaming her for the fad dying. Some probably just follow creator Peter Laird’s words not to like her. Or most just were just too old when the show came out, you guys weren’t the target audience anymore. It was for a younger generation of Turtle fans like I was. Ironically enough she is the one with the most personality and because of that the most interesting out of all the turtles. Also unlike other series when they introduce a character (such as Venus) and try to shove them down your throat that you end up disliking them, this is not really done with her and she isn’t forgotten either. She gets as much screen time as the rest and she isn’t useless either. Venus doesn’t really use her Shinobi magic introduced in the first episode that people complain about, which was a bit of a missed potential but a lot better than the Deus Ex Machina it could’ve been if they had abused it. Something bad is that she doesn’t have a trademark weapon.. The action figure makes it seem like its a fan like Kitana from Mortal Kombat but it isn’t the case here. She does seem to use two balls which their purpose I never understood, in one episode they serve as bubblegum…Though I do like the bandanna; I like how her bandanna is long and looks like a braided ponytail. I have mixed feelings about her color, the light blue looks great. However blue is already Leo’s color, and only other color I can think of is pink and that would look too stereotypical of girl=pink, plus I’m not sure how it would look. Maybe white would have worked better though. Her being a love interest never really happens, its implied a little bit with Leo and Venus in the pilot and never done again. Though there is one scene in her first episode were all the turtles have creepy “Imma vape u” faces on them while looking at Venus. I really like the suits actually, they aren’t bad and allow for movement. Sure they aren’t “realistic” like the first movie ones but they look good. I also liked the changes to the turtles, they had updated get-ups and I even liked that they had tweaked/updated weapons. 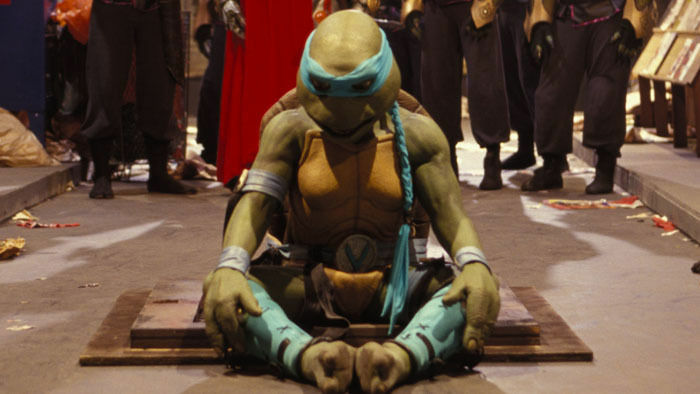 Donatello had a metal/tech bo, Leonardo had dual scissors like katana, Michelangelo’s tonfa while not great it makes sense as a substitution for his nunchuks. Raphael had an extra long sai that could put on a bo and have a Sai bo staff. Of course I prefer the original weapons but this show as more to bring a fresh air to the franchise which it indeed needed it. In fact I wish they had used the new weapons more often, they weren’t showcased too much; At least the “special features” of the weapons. 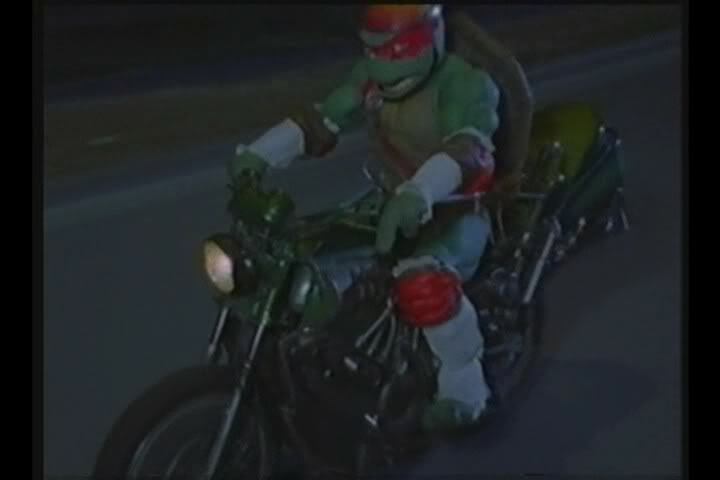 Seeing live action Raph on a motorcycle is pretty cool as well as the live action turtles on a jeep. Its something we’ve seen animated but never in live action. And while I can see the stock footage of them is annoying to some I actually found it amusing. Then again with all the Japanese shows I’ve watched I’m cool with stock footage. Though they do change up the stock footage a bit actually that was neat especially when Raph’s bike fell apart, that was probably a blooper and they decided to keep it. One thing the show is not very consistent is if the villains know the location of the turtles at times its like they don’t know but at others they do. 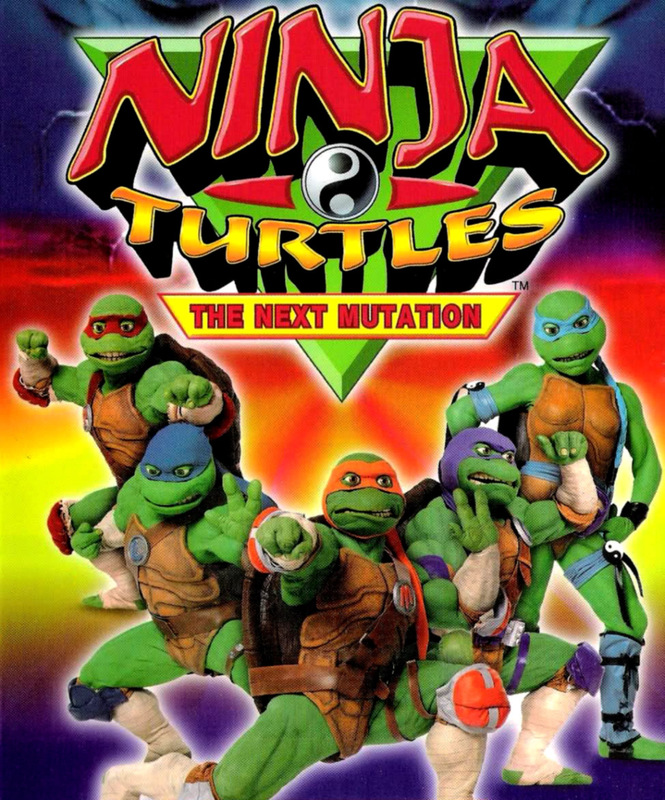 I liked that it was just called “Ninja Turtles”, since that’s what I called them, I didn’t like the whole Teenage Mutant part of the title as a kid too much which ironically I now prefer. It also showed how the turtles weren’t teenagers anymore, I seem to recall early promotional stuff mentioning the turtles had grown up and weren’t teenagers anymore. This show would have been perfect for me if I had been able to see it when it came out; I would have loved it. 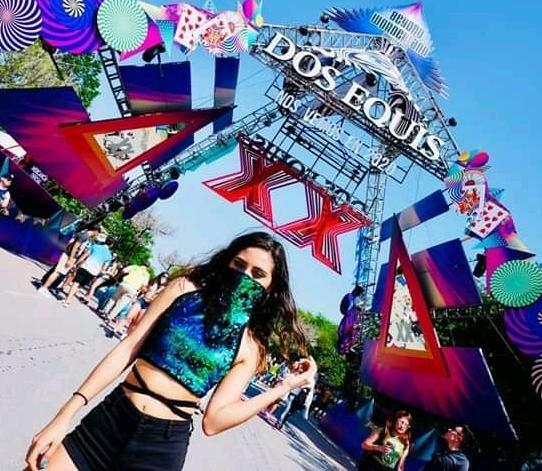 The show is not perfect however it is far from being the abomination that people make it out to be, not to mention its pretty decent and has its moments. I do tend to be a little positive on the show but that’s to counter all the undeserved and bandwagon hate it gets. 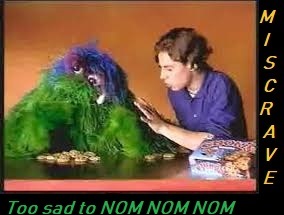 The show also made possible a team up of the two shows that made up my childhood.